The board received written reports from the Membership and Trail committees. The judges committee will be sponsoring a judges’ clinic at Alias Smith and Jones Ranch in Rogersville, MO on October 27 & 28, 2018. The sessions will begin at 9 am each morning. More information about the clinics can be found at mfthba.com/judges-clinics/. Recently there have been a variety of rumors regarding the promotions committee expenses from the past year. Shelly Robbins, the past promotions committee chair, submitted a financial report for the promotions committee that covered 2015 – 2017. Shelly also met directly with Jeff Shields, the secretary-treasurer, to review the reports and answer any questions prior to the meeting. Jeff Shields asked the board if they had any additional concerns or needed more information regarding this matter. There being no additional comment from the board, a motion was made, seconded and passed to accept the report and consider the matter settled. Karen Graddy updated the board on the process to register the MFTHBA with the European Union so that our horses can be sold and transported within the EU. The office staff will work on completing the proper paper work and getting that filed. Thanks to Karen for her help with this project. The board approved a cost share request from our California Affiliate for an expo event. Ad rates for this year’s catalog will remain the same. If you would like to place an ad in the catalog please contact the MFTHBA office. Our annual membership meeting will be held in conjunction with our October 9, 2018 BOD meeting. Election results will be announced at that time. The board will also be accepting recommendations for rule changes from the various committees at that meeting. 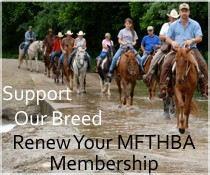 If you have a recommendation for a rule change please go online at mfthba.com/surveys/rule-book-survey/ or contact the office for the correct form to complete. Those recommendations should be received by October 1, 2018 in order to be considered by the appropriate committee prior to the Board Meeting. The board received written feed-back from a member regarding the quality of the judging on the final night of the Celebration. It also contained a recommendation for hiring and monitoring judges at future shows. This letter was read into the minutes. Members attending the meeting also commented on the quality of the judging on Saturday Night. Comments were also made about the level of negativity surrounding the association that is present on social media. The board appreciates all members who provide feed-back. If you have concerns or recommendations to be considered by the Board, please contact your Regional Board Representative and ask them to bring those to future meetings.